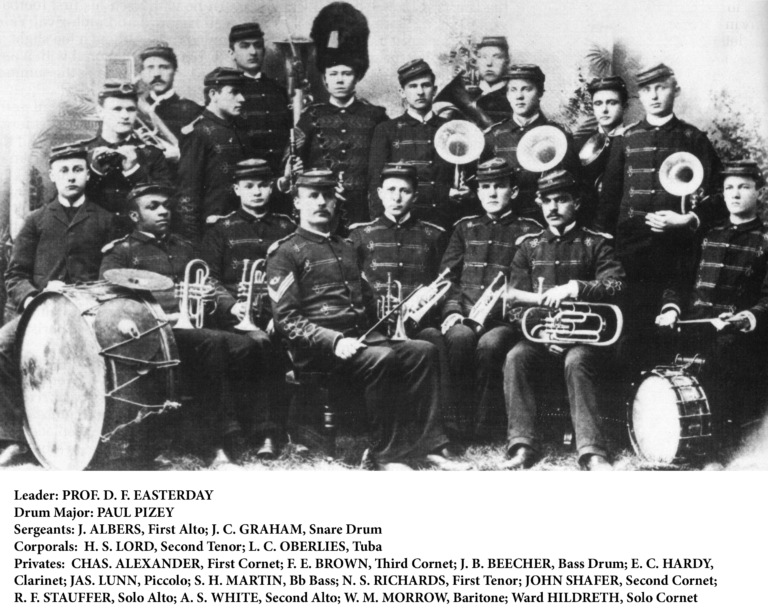 History of NU Bands | UNL Band Alumni Association, Inc.
October 1879, Lt. Isaac T. Webster started the University of Nebraska Military Cadet Band with 12 volunteers. April 1880, Lt. Webster retained Samuel B. Hohman as director from the Music Conservatory. January 1884, the first full time director of the Band, D. Frank Easterday, hired. May 1, 1887, played at the first athletic event, University of Nebraska versus Kansas State University baseball game. November 27, 1889, 19 cadets played at the first football game, University of Nebraska versus Omaha YMCA. Albert Toyer, a Cadet Band drummer from 1889-90 was instrumental in getting football started at the University. Toyer was the first football team captain until a preseason injury caused him to become the team’s manager. November 1892, Gen. Pershing required the Band to no longer be stationary, but instead march with the drills. This was first showcased at a football game where the military with the band marched drills at halftime. 1900, permanent seats were built in the new football stadium with a small bandstand. 1901, military drills at halftime of football games was stopped, but the Cadet Band continued to entertain. 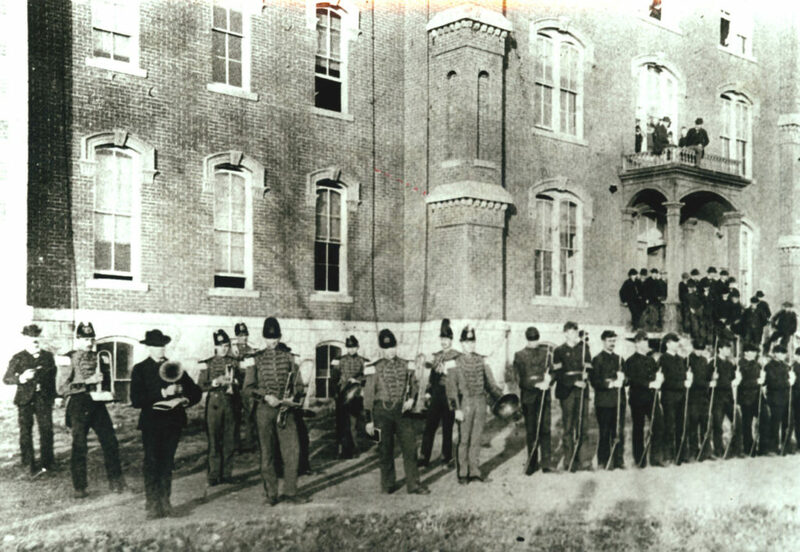 1901-02, Cadet Band on strike until funds were provided for travel to football games. 1903, Hagenow switched the block drills into square and circular formations for the halftime performances. He also added popular music to their repertoire. 1907, the Cadet Band became a regular fixture at the University’s graduation ceremonies. 1910, a reorganization in the military on campus created the 1st Regimental Band on campus and the 2nd Regimental Band on East Campus. The 2nd Regimental Band only last five years until they were absorbed back into the 1st Regimental Band. 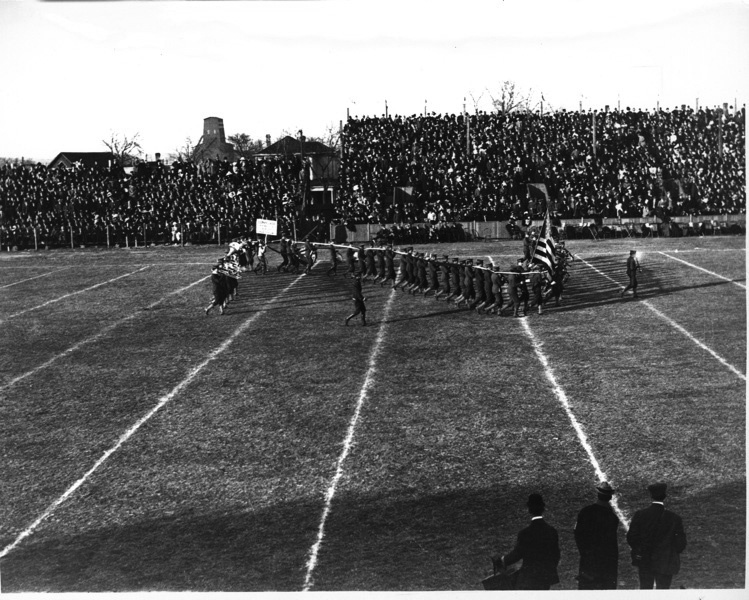 1911, the first time an ‘N’ was formed on the field by the band at halftime. NU Band on the field in 1911. Photo courtesy of UNL Digital Archives. 1912, members had to audition for a spot in the Band for the first time. 1912 Cadet Band. Photo courtesy of UNL Digital Archives. 1917, the Band requested to separate from the military, but the military and University chancellor refused. 1918, the Band consisted of both Army and Navy cadets for the first time since there was a shortage of men due to the war. 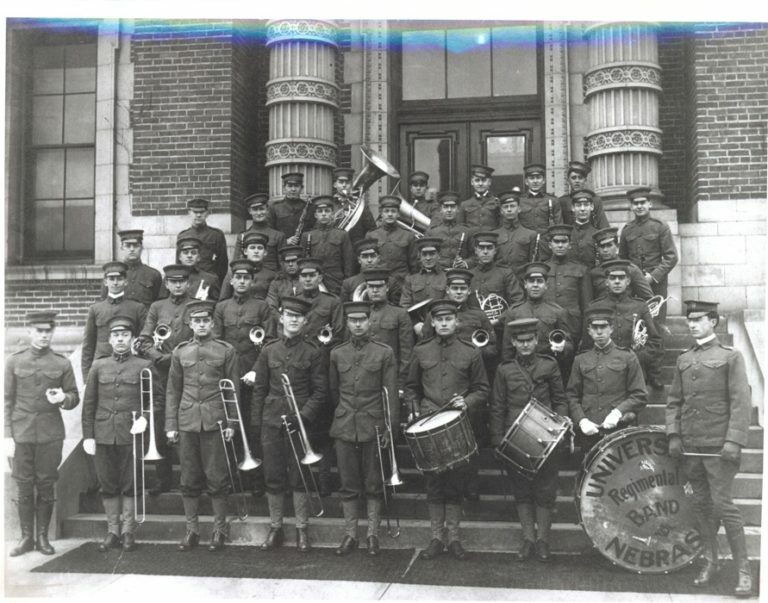 1919, the Cadet Band is now known as the ROTC Band. 97 men auditioned for 75 spots in the band. 1922, another request was made to separate from the military since many of the upperclassmen are not in the ROTC. Commandant Col. Mitchell refused. 1923, new football stadium built with a wooden platform on the 50-yard line for the band. 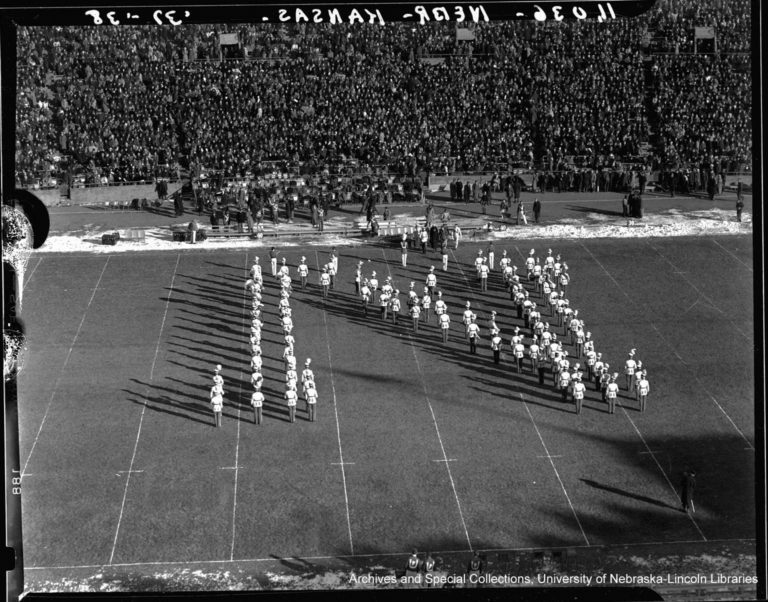 1926, new letter formations were added to the halftime. This was also the first time the Star Spangled Banner was played at the start of a football game. November 1, 1927, John Philip Sousa presented the University of Nebraska Band with the Sousa Cup. 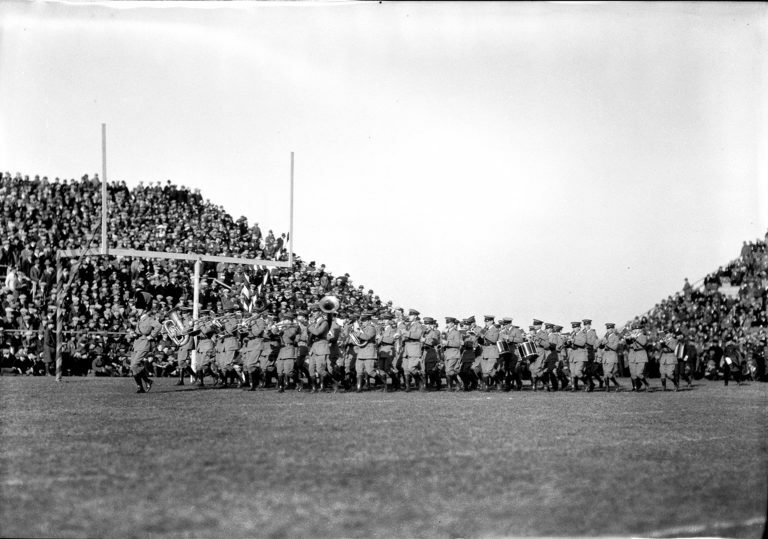 1936, Freshman was separated into their own band, led by Varsity Drum Major, Charles Ledwith, to focus more on drill. Photo courtesy of UNL Digital Archives. 1937, band member not in the military longer have military ranks; however, ROTC members still wore them. The band was no longer under military control. Leadership is made up of band officers. This leadership was in charge of creating and teaching the drill to the band. 1938, a specific concert “Symphonic” band was created separate from the marching band. 1939, an attempt was made to create a women’s concert band, but the instrumentation was not complete enough. 1940, women were admitted into the Symphonic band. Helen Frame Obitz and Bronte Broderick Fairfield were the first women admitted, followed by six more soon after. 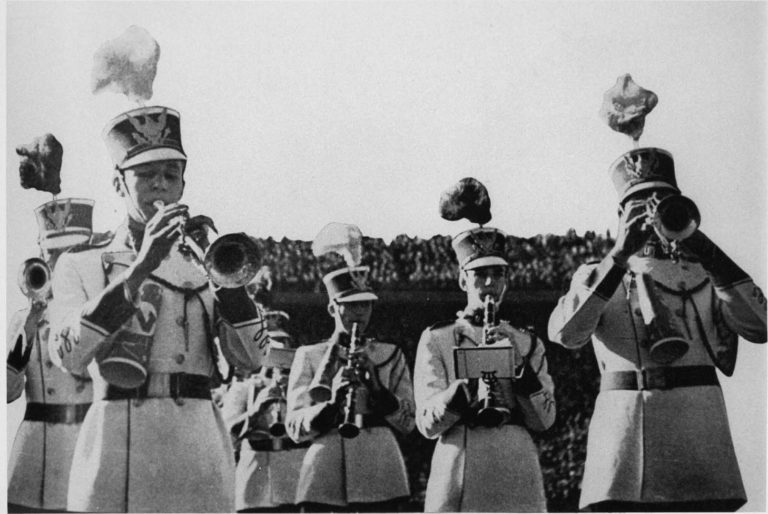 Some members performing halftime during a 1940 football game. December 1940, on a train to California to play for the 27th Rose Bowl Game on January 1, 1941, Band Song was written. The #7 ranked Cornhuskers lost to the #2 ranked Stanford Indians (21-13). This was the Cornhuskers first bowl game. 1942, Freshman band ceased to exist and merged with the Varsity Band. 1942, Women were admitted into the Varsity Band during the war. Winnifred Haskins Staub (42-44), Marian Gardner Ryger (43-47), and JoAnn Kelly Alexander (45-47). 1944 NU Band. Photo courtesy of UNL Digital Archives. 1945, A second concert band was created as the “Collegiate Band.” The marching band returned to all-male status with 120 members. It was ROTC in name only as most members at this time were not military. 1954, Military stopped funding band uniforms, but did continue to fund some instruments. 1960-61, the Huskerettes were added to the band with 16 pom-pon girls. They did not last beyond two years. 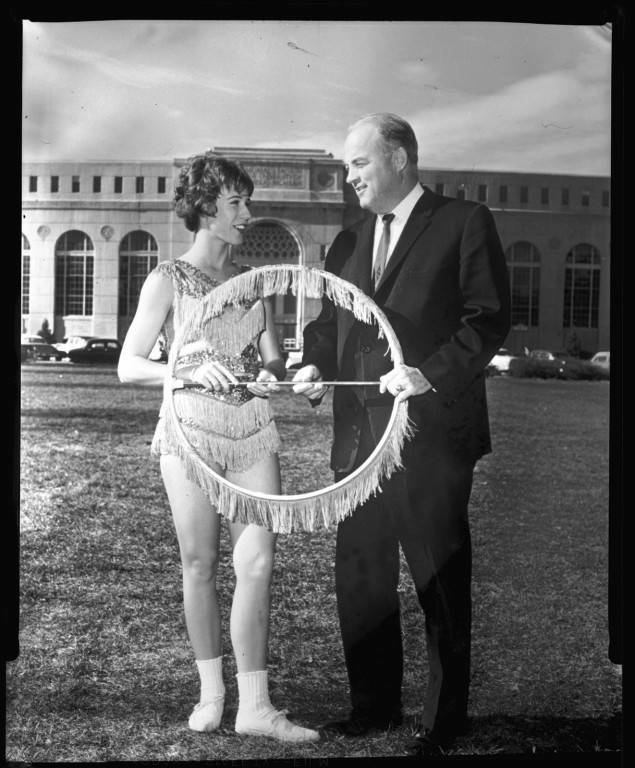 1961 Golden Girl, Joyce Burns became the first solo twirler of the band. 1972, Women were permanently added to the marching band. The first women were: Nancy Ringer, Nancy Wood, Ann Wood, Pat Stubbendick and Lilly Coniglio. Military cut their final ties to the band. 1975, the first Flag Line was added to the marching band. 1979, the Drumline formed from the drum section. 1996 recipient of the Sudler Trophy, given by the John Phillip Sousa Foundation, . The purpose of the Sudler Trophy is to identify and recognize collegiate marching bands of particular excellence that have made outstanding contributions to the American way of life. The month of April, in the year of our Lord eighteen hundred and eighty, was a cold one for the University and the city of Lincoln, as it witnessed the birth of the organization we now have under consideration. For years the cadets had limped painfully through the manual and the march with nothing to give rhythm to their movements except the unreliable “yip, yip” of some awkward scrub in the ranks, accompanied by deafening wails from a broken-voiced flute. On an evil day it was proposed that a brass band be organized. The idea intoxicated the authorities to such an extent that they determined to possess the luxury if it cost a farm. They heeded not the prayers and tears of the professors; they paid no attention to the threats and curses of the neighboring property owners. Scraping together a number of second hand instruments, they examined the lung power of the students, selected a dozen with the strongest breaths, turned over to them the brass and a Teutonic tooter, and told them to paint the town a lurid crimson if they so desired. The agony of the first three months of practice was frightful. The boys rehearsed regularly three times a week with so much success that before the term closed, two professors resigned, one died, and a student who roomed near the building was sent to the insane asylum. Then vacation, like a gentle spirit, descended upon the institution, and the uproar ceased. Panic stricken citizens who had been living in tents in the hoopskirts of the city returned to their homes, and Lincoln gradually resumed her wonted bustle and activity. But it was of short duration. Early in the fall the entire musical aggregation was on hand again, refreshed by the long rest and so anxious to show off that the boys would “discourse sweet music” free of charge, and when that was not allowed, would actually pay for the privilege. A committee of indignant citizens at once waited upon the Chancellor, and asked that the band be muzzled or required to practice out at the fair grounds. They were considerably mollified, however, on learning that Barnard, the bass drummer, had resigned, and finally agreed to let the matter rest if the boys would not give a concert as had been threatened. Later in the term, some prominent Lincolnites collected two hundred dollars, purchased a set of handsome gray uniforms and presented them to the band on condition that the donors would never be required to listen to any of its music. The later history of the organization is much the same as the foregoing; the only variation being in the quality of the alleged harmony, and the corresponding variation in the complaints of a patient and long-suffering public. It has had ups and downs, but the light of its life has never been extinguished since its birth – a circumstance which goes far to disprove the theory of the survival of the fittest.